What happens after a clinical trial wraps up? Trials in the United States are, by law, required to submit their FDA-approved medical research results to the database ClinicalTrials.gov. The database, operating since 2008, is a dumping ground of raw data and serves as the bare minimum of what a trial is required to do. The problem lies in the fact that those without scientific or medical backgrounds (i.e. – typical patients) cannot be expected to interpret the facts and what they could mean in their own lives. The ClinicalTrials.gov database, however, was never meant to replace journal publications, which often contain in-depth descriptions of methods and results and help support larger research reviews of a given drug. In an analysis of 600 randomly-picked database trials, it was found that only 50% had made their way into print. This happens for an array of reasons including researchers losing interest in the work or getting sidetracked with more urgent tasks or projects. Even among results that do get published, the lag time between completion of the trial and publication of data can be tremendous. A JAMA study from 2018 found that, across 341 studies in six medical journals, the median data age was 33.9 months at the time of publication, and the median time from final data collection to publication was 14.8 months. Obviously, this is not ideal. Delayed publication can have major, negative effects on the lives of many patients waiting for treatment or a breakthrough. Once a clinical trial has concluded, researchers have it within their power to turn the collected data around and publish their findings in a timely manner. Getting the facts out there and made available for the public should be a top priority. With patients seeking treatment for their sometimes life-threatening conditions, time is of the essence. The faster that advanced medicine can be introduced to the market, the closer we get to improved management of a condition or even a cure. 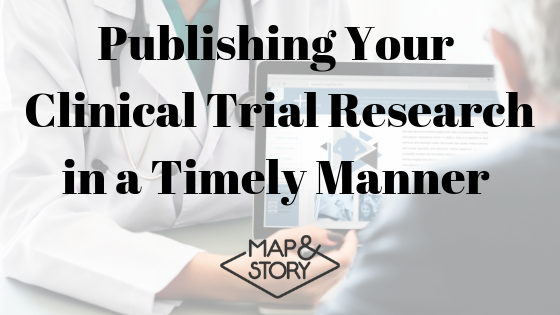 Therefore, publishing your findings in a timely manner is simply doing right by your patients. While clinical trials themselves are not greatly affected by delays in dissemination of results, the patients and the general public are. Implementing certain tools and techniques from the start will help to streamline the entire process and aid in timely review after data collection has been completed. Pre-registering patients, minimizing paperwork, tracking site-wide efforts, and being diligent with detailed records management are all methods that will help keep your trial on schedule and within budget. This will help maintain the flow of the trial process and make post-data publishing move along faster. What this all comes down to is the patients. They are the heart of every single clinical trial. Even after the research is over and the data has been collected, you still hold an obligation to those patients and the medical community. Publishing your results without delay gives patients the best chance of getting the treatments they need to live happy, healthy lives.